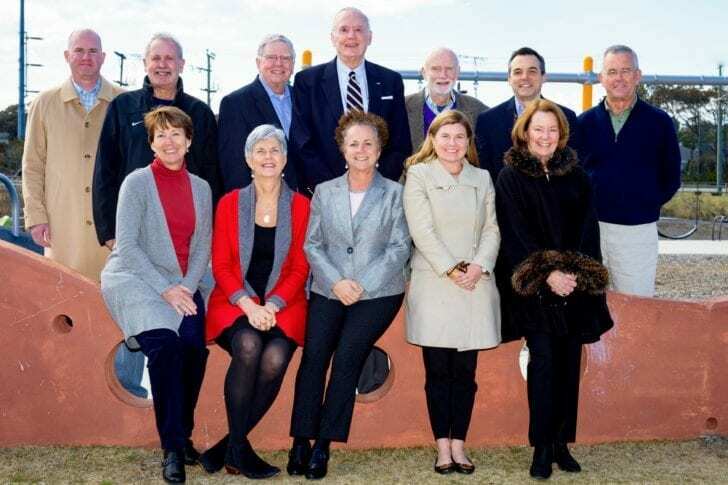 In its first meeting of the year, the new board of the Outer Banks Community Foundation awarded more than $66,000 to support 15 vital nonprofits. The grants will support a variety of local causes, from cancer support to music lessons for children, from historic preservation to environmental education. The Pea Island Preservation Society earned a Community Enrichment Grant of more than $29,000 for the “Freedmen, Surfmen, Heroes” project. Community Enrichment Grants are awarded on a competitive basis to nonprofits that apply for funds. With this grant, the Pea Island Preservation Society will share the story of Richard Etheridge and the Pea Island Life-Savers, illustrating positive messages of unity, diversity, and equal opportunity on the Outer Banks. The Pea Island Life-Savers was the all-black crew of surfmen best known for their courageous rescue of the E. S. Newman in 1896, when the heroic life-savers swam through a hurricane to retrieve the shipwrecked passengers one at a time, as the waves were too fierce for the surfboat. Elizabeth R and Company also received a Community Enrichment Grant: $10,000 to bring Verdi’s opera La Traviata to the Outer Banks on Sept. 15, featuring local star Tshombe Selby, the New York Opera Studio, and local artists and musicians in the orchestra, chorus and stage crew. The Dare County Youth Orchestra received $3,866 for student workshops with the Virginia Symphony, and the Outer Banks Center for Dolphin Research received $4,588 for dolphin monitoring and educational panels at Jennette’s Pier. Several donor-advised funds also made grants in March, including the Kelly Family Fund, the JoAnn and William Small Family Fund, and the Just for Today and Tomorrow Fund, in memory of Dorman N. Doutt and Florence B. Satterwhite. Donor-advised funds are managed on behalf of individuals and families, who recommend the grants that are awarded. This month’s recipients included a host of organizations, including the NC Coastal Federation; the Coastal Studies Institute; The Outer Banks Hospital for its Cancer Center Fund; the Coastal Voices program, and the NC Lions VIP Fishing Tournament. The Community Foundation also established a new grant-making fund at its March meeting: the Serbousek Family Fund, a flexible, perpetual endowment that will award grants through the Community Enrichment Grants program each year for whatever urgent local needs and promising opportunities arise. The fund was established by Janie and Michael Serbousek of Martin’s Point. The Community Foundation is now accepting applications for its next cycle of Community Enrichment Grants. Eligible projects must directly benefit all or a portion of the Community Foundation’s service area, which includes all of Dare County, and all Outer Banks communities, from Corolla to Ocracoke Island. Community Enrichment Grants support all charitable causes, including arts and culture, children and youth, disaster relief and prevention, education, the environment, historic interpretation and preservation, and other human services. Special Focus Grants are also available this cycle, with dedicated funds set aside for animal welfare, health and wellness, aviation education, and opportunities for people with disabilities in both Dare and Currituck. Prospective applicants are urged to review the grant guidelines online at OBCF Grants, and then call the Community Foundation to discuss their ideas. The application deadline is Friday, April 27, 2018. The Outer Banks Community Foundation is a public charity that connects people who care with causes that matter. The Community Foundation manages $17 million in 175 charitable funds for individuals and agencies, awards charitable grants to local nonprofits, administers 50 scholarship programs, and provides tailored services to help donors pursue their charitable interests. Since its inception in 1982, the Community Foundation has awarded more than $8 million in grants and scholarships to local nonprofits and students. Board members pictured are (back row, left to right) Clark Twiddy, Greg Honeycutt, Chris Seawell, John Tucker, Ray White, Scott Brown and Bruce Austin, along with (front row, left to right) Nancy Caviness, Teresa Osborne, Lynda Hester, Nancy Sugg and Jane Webster.